Our ability to sustain this level of support is entirely dependent on the donations, sponsorship and grants made to the Trust by our individual and corporate supporters and the generosity of other charities and trusts who share our vision for the field. In 2016, we were particularly fortunate to secure a grant of £90,000 across three years from the Dulverton Trust and it was this that allowed us to increase the number and size of bursaries awarded for the 2016/17 academic year. We were also able to award 14 CPD grants to practising conservators. Thanks to the news we announced recently of a new CPD initiative with The Clothwokers' Foundation (the Plowden/Clothworkers' Foundation CPD Grants), this number will increase very significantly in 2017, so we look forward to reporting on that in our next annual report. Of course, there is always more to do. 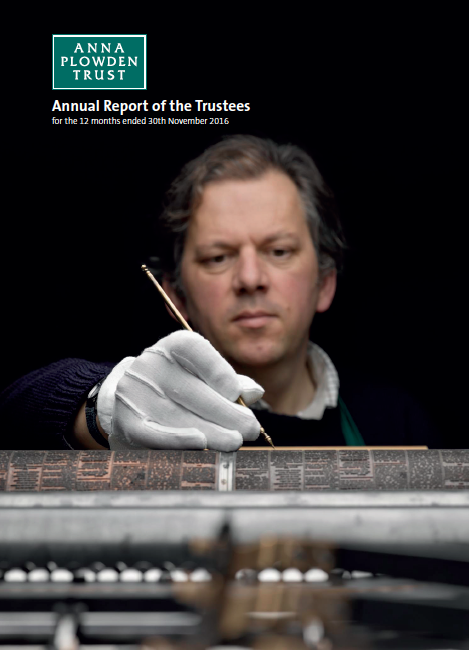 While the generous grant from the Dulverton Trust greatly helped the Trustees in their task of allocating bursaries, this was another year in which the grants requested (c.£300,000) far outstripped our ability to provide support. Rising tuition and living costs combined with fewer sources of funding, particularly for post-graduate study, make pursuing a career in conservation a costly option, but a choice we believe is incredibly worthwhile and worth supporting. We are greatly helped in preparing our annual reports by the fantastic feedback we get from recipients of our Conservation Training Bursaries and from those to whom we award grants for continuing professional development, who report on the experience gained and networks formed, and send images of conferences and site visits around the world.